5 Star stands for excellence in quality, craftsmanship and materials. Located in the beautiful countryside of Mena, Arkansas , 5 Star Equine Products is built on "good ole country values", hard work, friendly customer service and customer satisfaction. Although not the biggest company, 5 Star strives to be the "worlds finest". Equine enthusiasts throughout the world seek to maximize the potential of their horse through aspects of equine stewardship. The five components that allow a horse to reach its potential are: genetics, nutrition, health care, training and equipment. As a result of these five critical components, 5 Star has focused on producing the finest, all-natural products available to the equine industry. 5 Star stands for excellence in quality, craftsmanship and materials. Maintaining excellence is a standard, which is met by carefully selecting the finest, pressed virgin wool felt, leather, mohair and hardware. Products produced always receive full consideration to conformation, movement, natural therapeutic comfort and application. 5 Star produces 100% wool felt pads, mohair cinchas and wool blankets specifically designed to fit what is right for horses and mules. The 5 Star Contoured Pad is the Original Western contour pad with "a true French Curve back line and withers slope." Special attention is given to wither height, backline variance and hip placement which results in a great fitting pad that conforms to the shape of your horse or mule. This conscious effort in design has produced a pad that fits most breeds of horses and mules without "break-in" fitting. Top quality, pressed, high density 100% wool felt is the base pad component, with 5-6 oz. wear leathers on the sides and top line. This wool felt is manufactured to strict specifications, using the highest quality virgin wool (100%), that allows for the highest degree of protection and economic benefit. Can I Customize My Saddle Pad? Customizing your 5 Star pad is a good way to make it uniquely yours and can be done several different ways. Check out our choice of cowhide leathers at our website. Another way to customize your pad is to put an embroidered patch on the back corner of your pad, or to put your initials on the front corner of your wear leathers. Be sure to see some we've done so you can get an idea for your very own! What Separates 5 Star From Other Saddle Pads? We will tell you what other companies won't! Marketing of saddle pads has become big business. All one has to do is make a web search and you will find over 15 pages of manufacturers. Each pad company puts various marketing emphasis on their products. Emphasis ranges from comfort, fit, durability, ease of cleaning, cooling, compression protection, performance, close contact, blood flow to animal's back and the list goes on. Our focus is on all of the above plus being cost effective as to give you not only a great product, but a great deal! Why Use Wool For Saddlepads? The unique structure of wool fiber allows it to be pressed together with heat and steam to form a dense mat of flexible, resilient and elastic fiber, called felt. This all-natural material has kinetic properties, which enables it to absorb moisture and wicks it to drier areas as the concentrations increase. This wicking is what assists in heat removal. Research has proven that wool felt pads provide the best compression protection for properly or improperly fitted saddles. No other pad or blanket is necessary with the 5 Star Contoured Saddle Pad. Double padding creates movement and slippage. Over-cinching usually compensates for this slippage. The contoured fit of our pads means a limited need for cinching with minimal saddle movement. Square cut pads do not follow a horse's back contour. This can result in unnecessary pressure and improper saddle fit, which may cause pain and injury to your horse. I just got my 5 Star Wool Pad and can't believe how gorgeous, well fitting, and comfortable it is! They even put my initials on it. I love it-- and am SUPER IMPRESSED with the quality, beauty, style and comfort! 5 Star Contoured Barrel Pads are the best for keeping your horse comfortable and your saddle in place. That way they can give you their best performance! Available in square or round skirted styles. Also can be customized with your personal touch by adding hair on leathers and a logo patch. This awesome pad is available in both the mule and horse contour. The gullet hole is open (to keep it user friendly), but has a leather flap over it to prevent twigs and debris from falling into it and working under the pad. Protect your pad investment with this “disposable” pad liner from 5 Star Equine Products, Inc. Because it is made from wool (just like the 5 Star pad) it still provides all the benefits of wool for your animals back, and it will not slip out from under your pad. Successful field testing has gotten rave reviews on this newest product from 5 Star. Made from ¼” felt, it is designed to be the “dirt catcher”, so your pad will stay clean and pristine! The liner can be hosed down to clean, but when it is “used up”, turn it into a cat/dog blanket or boot mat and get a new one for under your 5 Star Saddle Pad or contoured Saddle Blanket. It can be trimmed with scissors to fit a custom pad. Liner is cut square but will quickly conform to the pad contour. Standard size is 30”x30” and full skirt size is 32”x32”. These Saddle pads Sound Great! How Do I Order? You can order online using one of our online dealers or just give us a call and we are happy to assist you! Order Your 5 Star Saddle Pad Today! Stop torturing your horse and your wallet with overpriced, less protective saddle pads. 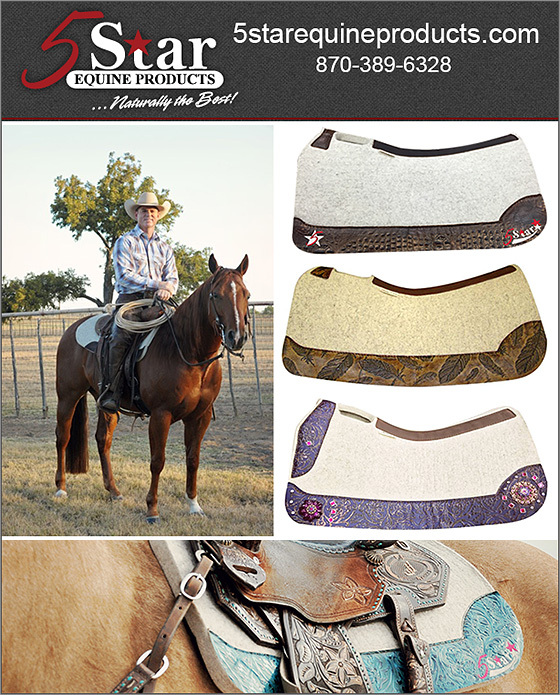 5 Star Contoured Saddle Pads are comfortable for your horse, and stylish and affordable for you. So what are you waiting for? Order Today!